Google & Microsoft…Bullies on the playground? See the NOTE at the bottom. As I mentioned in that article, I was finding Google was becoming a little too controlling and I was becoming increasingly unhappy about our current relationship. After recent events, my patience with Google has been stretched thin. You see, Google and Microsoft used to play well together; but after the release of Office 2013, the two giants are and have been battling, and the consumer is caught in the middle of the squabble. One of my clients ordered a new system from an independent shop with Office 2013, back in April. She then asked me to come in in May and set up her system in her home office. Honestly, I figured I would pop in, set up her Gmail Apps for Business accounts, configure the backup and Blackberry, and have a happy client within a few hours. You know what is said about best laid plans? It turned out Google hadn’t released the Google Apps Sync for Outlook at the time I first went in during the month of May. I set up the client’s email, knowing she didn’t have the whole calendar/contact sync, but according to the Google forums at the time, it was coming soon. We just had a to be patient a little while longer. In the meantime, we ordered a laptop with Windows 7 and Office 2013 Home and Business from Dell. 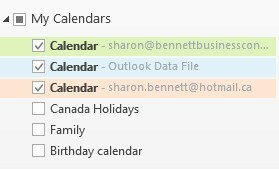 By that point, it was early June and Google has released the Outlook integration model (kind of). In mid-June, the Dell unit with MS Home and Business 2013 arrives and I quickly set it up, with the Google Apps Sync for Outlook, and the client is up and running very quickly, except for some tweaking. Next I head back to her home office and to finish the setup on her desktop. Since Google has released their software, I am sure this will be a snap. Many hours later, after a discussion with Microsoft and a Google reseller, my client still does not have a proper working desktop system at home; and the worst of it: she is not happy, which upsets me. And what has caused all of this grief, you may ask? This should be a no-brainer, right? Think again and prepare yourself and your clients for what is turning into a miserable mess. According to the Microsoft reps I spoke to, Office 2013 is Click and Run only (unless you have volume licensing). I don’t know about you, but none of my small business clients have volume licensing, because it’s usually unnecessary for their needs and budget. Google released it’s Google Apps Sync for Outlook, but it is not supported on Office 2013 Click to Run. 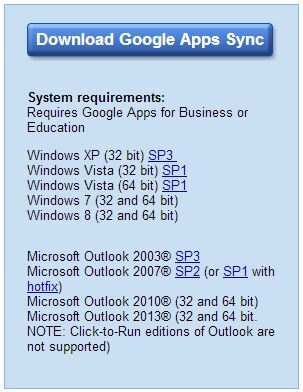 Office 2010 was also Click to Run, but we had the option of downloading the msi and Outlook 2010, and Google Apps Sync would work seamlessly. So what’s the solution? In this case, the client returned the unit she bought, and we ordered a new desktop from Dell with Microsoft Office Home And Business installed; as I have been assured by the Dell rep that the Office 2013 pre-installed on the Dell systems is not Click to Run. Moving forward with this company, we will order all units preloaded with Office 2013 from Dell, until this mess can be straightened out. Who am I upset with? In this case I am upset with both companies. I understand why Microsoft is releasing software in this fashion, but they should make an MSI version available, as they did with Office 2010, for those of us who want more control over our installations. But in this case, I am more upset at and with Google right now. Office 2013 has been available to the public for 6 months now, and the manufactures had it back in the fall of 2012. I am not a programmer, but if Google can make self-driving cars, how hard is it to get Google Apps Sync to work on the Click to Run version of Office? Why can’t these tech giants all get along? These companies are forcing their clients to side with one or the other, and it feels like the bully in the schoolyard. Remember “if you play with him/her, I won’t be your friend”? Unfortunately, small business consumers are the ones who are going to be most affected by this, and I am sure we’ll hear more about this problem as time goes by, and more people move to Office 2013. The playground is much happier when everyone can enjoy playing together, no matter where you come from. I think it’s time for both Microsoft and Google to grow up, and play nice with each other, and all the others on the playground. If you read my previous blog post (click here), you know that my laptop died a few weeks ago. I knew it was coming, and decided to make the jump the day it died ( I ordered the new system then my current system over-heated for the last time later that same day) and purchased a laptop with Windows 8. My husband has been using it since the preview was available and he loves it. Plus, I was at a Microsoft event the week prior and liked what I saw. I knew I’d have to learn it at some point, so it seemed like a good time to dive in. My new laptop arrived the following Tuesday night and I planned to set it up (transfer files, etc) the next day, since it was my scheduled “work at home day”. I expected I would have the time to figure it out, get used to it, and play with it before I got started on any work. By 9 am Wednesday morning, I had two client issues I had to deal with, and I still hadn’t transferred my files, or even had Office 2013 (which I am really liking) installed or configured. Luckily, I had been working in the cloud during my non-laptop period, so I continued working, using web-based services on my new laptop until I could find the time to set it up for my workflow. I assumed I would just be able to carry on, Windows is Windows, right? Soon, I encountered a problem: not only was I trying to help my clients with their work, but I was trying to do so on a new operating system (which I was struggling with) without my standard “go-to” applications and I was becoming very frustrated. Once I had my clients hiccups resolved I configured the system for my use. I noticed some great new features in Windows 8 that I love, such as image mounting (awesome), and the fast boot-up time. I can’t wait to jump-play with Hyper-V (I know that will be a huge plus for me). And when I have some free time, I’ll play with Windows to Go. Despite all the pluses, I am not sure I am really liking it yet. As I mentioned before, I had to learn how to navigate Windows 8 on the fly. Heck, I even had to Google how to restart it. The interface formerly known as “Metro” is confusing, and I don’t understand why it’s on a non-touch device. I find “searching” the requires more clicks/keystrokes. Switching between “Metro” apps and the desktop is confusing and requires more clicks. I am not even sure if Skype is open! For a standard 9-5 Monday-Friday job, I am not sure I would recommend Windows 8. My husband said I was being such a “user”, but if I am struggling, then I know my business clients will as well. I’ll follow up in a few weeks with my feelings after a month of Windows 8. Awesome netbook, not a laptop. 2. My next big obstacle was Outlook, or should I say, the lack of. As much as I love Google, I really don’t like their web-based mail experience. I use Outlook for all of my mail, tasks, and scheduling. Because of the amount of mail I have to manage, I found Google’s lack of folder structure overwhelming. If I were to use Gmail, I would have to modify my email workflow severely. By day two, I had to install Office on the netbook so I could have the basic functionality to work effectively. 3. The third “roll of thunder” was not being able to access my financial application. Okay, I always manage to find an excuse not to do paperwork, but I have to admit not being able to see my company financials bothered me. I am considering moving my financials to a cloud-based service for this reason. On a side note, when I went to bring my financial backup from cloud storage to my new laptop, the file was corrupted. I recently installed Microsoft SBS 2011 Essentials with Office 365 integration and was more than pleasantly surprised with the outcome of integrating the two products. I have been working with Microsoft Enterprise servers for many years of my career, but moved into the Small business Server space a few years ago as a solution for my small business clients. Microsoft Small Business Servers are designed specifically with the needs of the small business in mind. For a full list of features visit the Microsoft SBS website. Microsoft Office 365 was released in June 2011. Office 365 provides Microsofts business productivity products, Exchange, SharePoint, Lync, and Office Web Apps as cloud services. This reduces the need to host these services on-site, greatly reducing IT costs. The client, for this installation, has a small office with 4 full-time employees. They use a custom third-party application that requires a “server” type of installation, which was installed on a Windows 7 computer. They share files in the office, but email, calendars, and contacts were not easily shared. They wanted to be able to effortlessly share email, calendars, etc., between staff members and be able to access company documents from outside the office. We decided to implement Small Business Server Essentials with Office 365. SBS Essentials is a slick little operating system designed for the small businesses. It is easy to setup and once configured, very easy to manage. It provides the security and the basic functionality of its big brother, Microsoft Server 2008; but in an easy to use, slimmed-down package. For more information, please visit Microsoft SBS Essentials webpage. In late 2011, Microsoft provided an Office 365 integration module with SBS Essentials. We moved all their email and webhosting to Office 365. This provided the sharing required, plus real-time collaboration using Lync and SharePoint for securely sharing documents. The client can also rebuild and maintain control over their website, which they didn’t have before. The Office 365 Outlook integration provided a seamless Outlook experience for the client, whether they were using it on the desktop, laptop or web. We moved the 3rd party application to the new SBS server, which has increased performance of the application itself, since it is now being hosted in a proper server environment on appropriate hardware. All the computers in the office are backing up to the server, and file-sharing was enabled. By far, the most beneficial feature for this client is the Remote Web Access feature (which was very easy to setup). The client can securely access her desktop from her laptop with a click of the mouse. She is currently on vacation, easily accessing her office desktop and server. Combine SBS Essentials with Office 365 and now you can leverage some of Microsoft’s most powerful big business tools into your small office. Your small office can now be on the same playing field as big business without the IT costs and frustrations. Well done Microsoft. As promised from blog post (How to Take Control of Your Unruly Outlook Inbox) here is the post on Outlook Rules. Rules are a great way to organize your emails into bite size chunks. You can prioritize your email using Rules, this way the important “need to respond to” emails do not get “lost” in your Inbox. Rules can also apply a specific action on a given email. This will reduce your time trying to keep you Inbox organized by manually dealing with each email. Once you start using Rules you will wonder how you ever managed your email in the past without them. Everyone will choose a different way to create Rules and organize their Inbox. My preference is to create Rules for “important” people, like my boss or specific clients and on the email subject line. I also use Rules to manage my subscribed email lists or LinkedIn group emails. My home email contains Rules based on family member. I have an extremely large extended family and I find it easier to group together specific family members i.e., my mom’s family, my husband’s moms family, my dad’s family. You get the idea. I’ll use the example of an “Important” person for our example. In this case the important person is My Boss. When an email arrives from My Boss I want to be notified immediately. As you can see from Figure 1 I need Outlook to notify me that there is an email from My Boss. Always move message from: (senders name) – this option is great for moving the selected “senders” messages directly to a folder without any options. I use this option for subscribed email lists or LinkedIn group notices. I can then browse these folders at my leisure and avoid these distractions in my Inbox. Create Rule… – this option will start the process of creating a new Rule based on the email you have just right clicked. Manage Rules and Alerts… – use this option when Rules and Alerts already exist and you just need to manage and/or edit the Rules and Alerts. You will now have three options in which to select the conditions of your Rule to best meet your needs. You can base your Rule on the “From” field. If I wanted to filter the email on the Subject “Meeting Today” then I would select option two. You can also create your Rule based on who the email was “Sent” to. These options can also be combined to create very specific Rules. In this case I care about all emails from My Boss regardless of the subject or who else the email was sent to; therefore I would only choose the first option as shown above. I also want to be notified whenever an email from My Boss arrives. To do this I would select the first two options under the “Do the Following” section. Display in the New Item Alert window (this would be a visual cue in case I have the sound on my computer was turned off) and Play a selected sound (this would be auditory cue in case I was not looking at my screen). You can choose the audio file you would like use for this alert. In the example above I left it as the default but normally I would change the sound to play a unique audio file (maybe the Star Wars Imperial March). The reason for this change is to be better alerted of the incoming email from My Boss. If I use a standard windows wav file, the sound may get lost in the rest of the Windows sounds that I hear during the day. By changing the wav file to a unique audio file it is more likely I will hear the alert when the email arrives. The last option, Move the Item to the folder, would be selected if I wanted to move all email from My Boss to a specific folder in Outlook when the mail was received. In this case I do not want to have to go to open up another folder to see the email and would prefer to be able to quickly see the message in my Inbox view. Once you are satisfied with your Rule click OK and you will receive a “Success” dialog window. You will notice within this window is the option to run the newly created Rule on the current folder. This is a great option if you are trying to clean up your Inbox (see article How to Take Control of Your Unruly Outlook Inbox). That is the basics of Rules and for the most part this should be enough to help organize your Inbox and keep it organized in the future. As with most Microsoft products they are more Advanced Options (including Marking as High Priority or Deleting) that I did not cover in this article. If you wish to learn about the Advanced Options please send me an email or post a comment.